Today was the big day! It was the day where we got on the aircraft and ran through our emergency scenarios. These drills are significant for a number of reasons: Firstly, they are by far the hardest! There are an infinite number of things that could happen if a plane goes down and we need to be ready for any of them. Therefore our drills include details like evacuating an aircraft that’s landed on water or land, that we know is about to crash and have time to prepare or that suddenly needs to be evacuated without warning. We have passengers that are hysterical, blind or deaf, with babies, and much more. But perhaps more significantly, these are the last of our drills. That’s it, No more! Tomorrow morning we have an exam on security procedures, and tomorrow evening we officially graduate from Safety Training. We’ll no longer be candidates, but actual flight attendants! Starting Monday we’ll have 5 days of service training. and then we’ll be ready to hit the skies. The drills today were scheduled to start at 4am. Our aircraft was late being delivered to us for practice so we actually started around 5am. Class yesterday went on for a full day and combined with all the excitement and preparation for today we each had about 4 hours of sleep maximum. The first thing we did upon boarding the aircraft was to individually sit at our jump seat and yell our evacuation commands individually. This was to confirm that we knew all the commands by heart, and that we could be loud and fierce enough to be heard throughout the entire cabin. Its amazing how loud you actually need to be! You think you’re shouting but then they tell you that you wont be heard more than 5 rows away. The volume really needs to be stepped up. The next step are the actual evacuations. We were divided into groups of 5 or 6 and placed in different scenarios. Each group had to conduct a prepared evacuation and an unprepared evacuation. 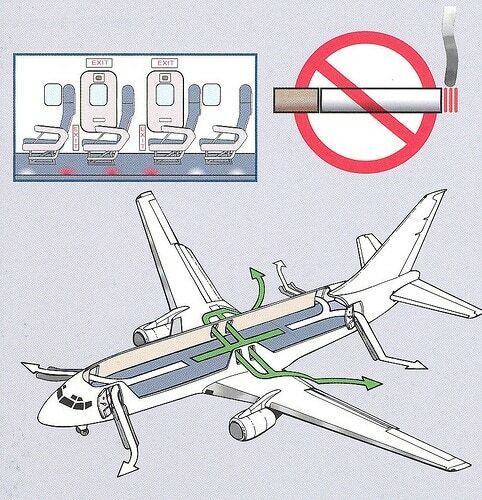 For an unprepared evacuation, we’d probably already be seated in our jump seats. Suddenly we get the evacuation signal and we start yelling something to the tune of “SEATBELTS OFF! YOU AND YOU, KEEP PEOPLE BACK!” We’d follow our procedures to open the doors and get everyone off as soon as we could. We’d then check the aircraft for anyone left behind, grab our emergency equipment, and get off the plane. An example of a prepared evacuation would be as follows: We’re in the middle of a meal service when the captain informs our cabin manager that we’ve had a mechanical failure and will be ditching into the ocean. We have about 15 minutes to secure the cabin for landing and brief our passengers. In these time we stow all the loose articles on the cabin, perform an emergency demo presentation for the passengers to inform them of what’s happening and how to evacuate, brief selected passengers on how to assist us or open the door should we be incapacitated, and get to our jump seats in preparation for landing. Once in our jump seats the rest is more or less the same as an unprepared evacuation. We all did great! We were all extremely nervous for this one, as there is so much to do. Luckily we have fabulous instructors who were able to help learn everything we needed to know. We have the rest of today off, although I’ll spend most of it studying for my Security Exam tomorrow morning. The safety part is what it is all about! As a potential future passenger on your airplane, I’m glad that you paid attention to this material and know your stuff. It is a lot more important than getting the proper number of ice cubes in the glass!